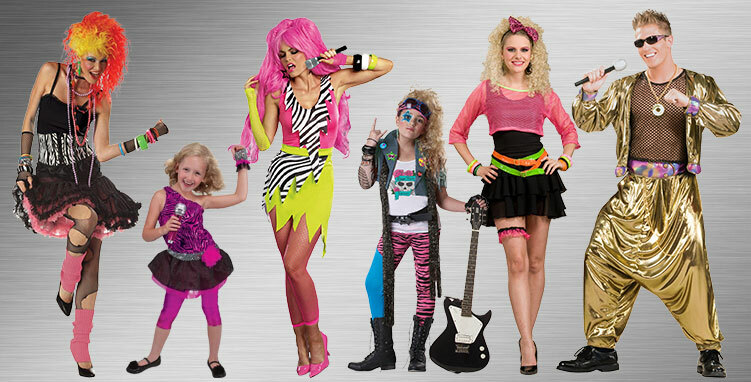 The wild styles of the eighties are here to add some color and pizzazz to your next Halloween event! 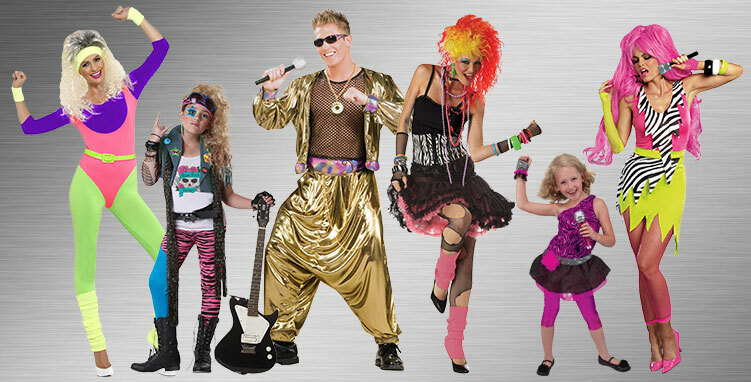 These 80's Costumes include lots of accessories like gloves, bracelets, leg warmers, and spiky wigs to help you get the authentic feeling of this colorful decade! There are lots of items for kids and adults to use for their next costume party, or while trick-or-treating! The 1980s started off with big hair and even bigger attitudes. New-wave synth pop was blaring from stereos and Walkmans across the U.S., and the side ponytail was the girl next door’s go-to look. With track suits and neon colors, this decade is easily replicated and recognizable, making it the perfect costume for a blast from the past. As track suits started to make way for denim and flannel, the 1990s were well under way. From totally clueless valley girls to grungy rockers, the '90s were full of some pretty dope times. Basketball players rocked high-top shoes with high-top hair-dos to match, and everyone was stoked to see what the 2000s would bring. 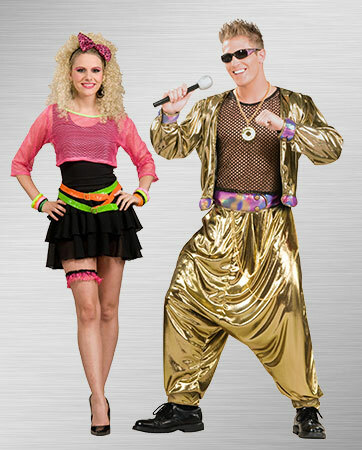 Dig into your old CD collection and rock the whole ensemble for your next costume party. Whether you are breaking a sweat in jazzercise, getting pumped up in the gym or watching a Richard Simmons VHS in your home, the 1980s were full of peppy people who were looking to stay fit. Jump around the party keeping the energy up for your next gathering. 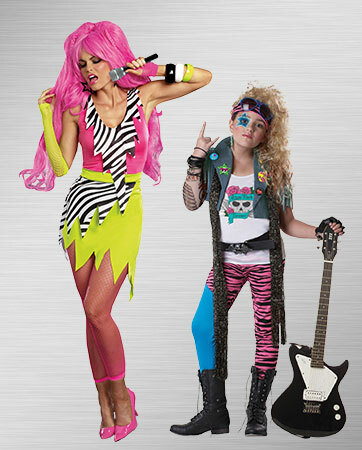 Whether you were a fan of Madonna, Whitney Houston or Tiffany, you will be ready to belt out the chorus to your favorite tune in this shimmering punk rock star getup. There won’t be a doubt in the room that your little girl was meant for the limelight! Not the best costume in the room? As if! 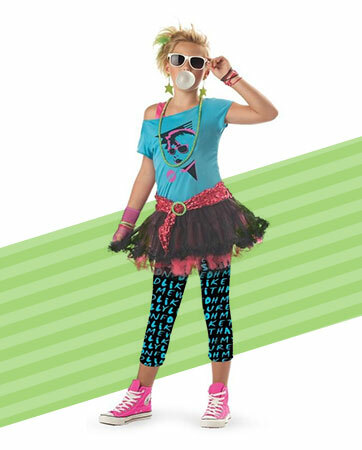 Paired with your perfect valley girl impression, this costume is totally out of this world. You will leave everyone speechless and super jealous of how radical you look. Getting ready for a smack down? You will be showing off your best moves in this stand-out wrestling getup. From the big blond hair to the vibrant shorts, you certainly won’t be overlooked. Just be sure that you can back up all the big talk. Brush up on your beatboxing skills and jot down a few fresh rhymes so you can really play the part of a rapper straight out of the '80s. Whether you have some sick dance moves or you’re all about the mic, you’ll stand out in these golden hammer pants. The bigger the hair, the better the show! Put on a good one with this all-out rock star ensemble. Belt out that high note or grab your electric guitar and let it rip. You’ll take center stage in no time. Nobody knows how to get down quite like the retro rappers do. This party won’t stop till 6 in the morning. You will be balling hard with your golden ensemble and your groupies by your side. Don’t worry, though, you know everyone is jealous of you. There is, like, no way that anyone at the party will look as good as you do. With your hair teased to the max and all of your favorite accessories, you are ready for a night on the town with your gal pals. Make it a family affair this year and let your mother-daughter bond take the limelight. You two are the perfect duo whether you are singing sweet harmonies or rocking out on your guitars. 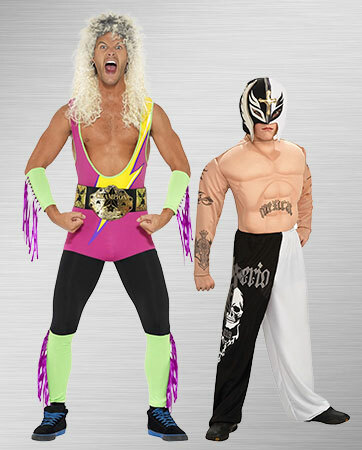 Boys will be boys, so let father and son make the most of the costume party and play the part of retro wrestlers. These tough guys will put on a show for sure! It’s all in the accessories when it comes to the perfect outfit – and any true valley girl knows that! You’ll look like you just hit the jackpot at the mall with this stellar look. Show off all the coolest '80s trends that put you on the hot list. After getting your tan on you can get all dolled up in your new dress and neon accessories so you make a statement when you walk in the room. 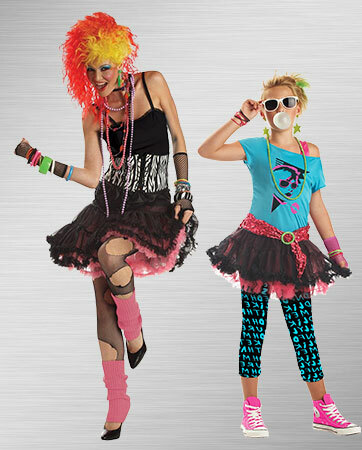 DayGlo and scrunchies never looked so good! With a blast back to the '80s, this stellar style is so your jam. Rock out with your Walkman on to some head-banging hair bands or some bouncy synth pop and get this party started. Your far-out look can imitate any of the numerous icons from the decade or just embody the era itself. From Seinfeld and the Titanic to Beverly Hills 90210 and Forrest Gump, this decade is full of pop-culture references that we still rely on today. Whether you are making the perfect impression of one of the characters on your favorite show or rocking out as your favorite grunge band, this era is packed with the perfect costumes for your next party.